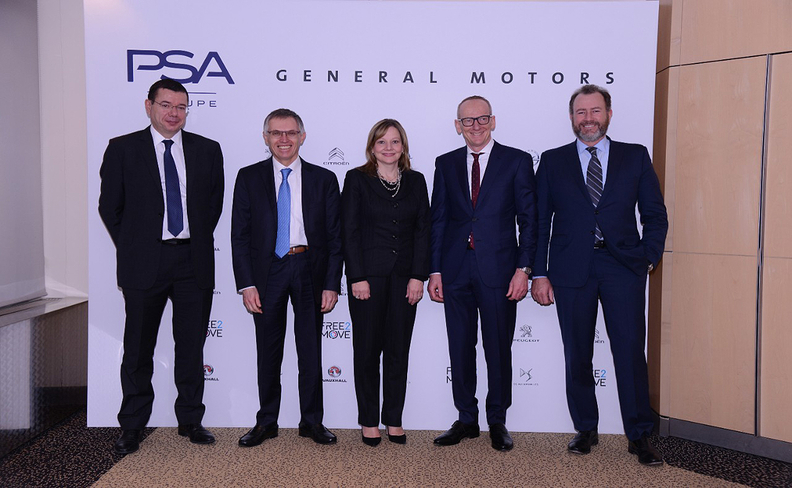 PSA and GM executives at Monday's announcement. GM President Dan Ammann, far right, said: "The transaction will enable us to increase our returns to shareholders." General Motors executives said they decided to sell Opel because Europe’s changing geo-political and regulatory climate demands greater investment at a time when they see a greater need to invest in North America, China and emerging technologies such as autonomous vehicles. The $2.3 billion deal with PSA Group will not only free up GM resources for more lucrative opportunities, but it also will give the automaker a greater ability to return cash to shareholders in a continuing bid to raise its stock price. “By immediately improving General Motors’ overall business profile, the transaction will enable us to increase our returns to shareholders,” GM President Dan Ammann said at a news conference early Monday in Paris. Ammann said the European automotive market has become so different from GM’s other major regions that only 20 percent of the vehicles in Opel’s future portfolio would have been shared with the rest of GM. That means a company such as PSA is in a better position to provide the necessary scale, he explained. Ammann and PSA CEO Carlos Tavares repeatedly spoke of the “industrial logic” behind combining of PSA and Opel. For GM, the upside is no longer having to pour money into a region where the benefits to the rest of the company’s operations are diminishing. The sale, expected to close by the end of the year, comes as Opel was close to finally making money again after nearly two decades of losses. But the profit opportunity GM saw in Europe is far less than what it already is generating elsewhere, particularly in the U.S.
PSA said it expects Opel to produce operating margins of 2 percent by 2020 and 6 percent by 2026. That compares to GM’s margins of more than 10 percent in North America for the past two years. The company has projected it will achieve that target again in 2017. GM said the deal will free up $2 billion in cash to use toward repurchasing its own shares. The company is in the midst of a buyback program that it recently expanded to a goal of $14 billion. At the same time, GM said it will have to take a primarily non-cash special charge of $4 billion to $4.5 billion in connection with the sale. GM said it will pay PSA 3 billion euros ($3.18 billion) to settle transferred pension obligations. GM said Opel will continue to provide some vehicles for its Buick brand and for its Holden unit in Australia. GM and PSA, which have collaborated on some vehicle development since 2012, said they also will work together on electric-vehicle technology. Last year’s vote by the UK to leave the European Union clearly played a role in GM’s decision. During today’s news conference, Barra was asked if Donald Trump’s election as U.S. president was a factor, given his emphasis on reducing imports and proposal to tax vehicles that are brought into the country. Barra said only that the “changing landscape” in Europe and other parts of the world led to the agreement.